With an incredible final performance against Denmark’s Viktor Axelsen, world #1 Kento Momota became the first ever Japanese men’s singles player to clinch the All England title. 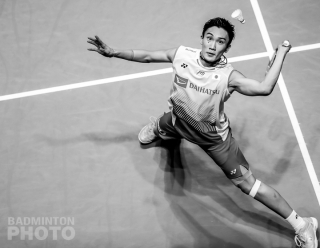 It was written, from his junior days, that Kento Momota (pictured) would top the world. 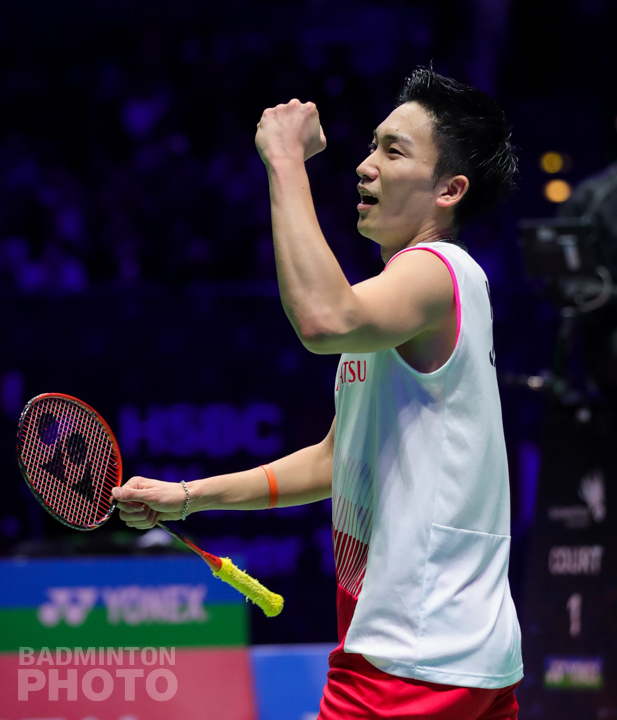 The reigning World Champion once again wrote his history in a splendid final, against Viktor Axelsen, becoming the very first men’s singles player from Japan to come out first at the All England. “I am very happy to become the first from my country to win at the All England, but it’s not only my achievement, it’s all thanks to my team and my supporters,” said Kento Momota, all smiles after his win. Kento Momota took an early lead in the first game, answering all Viktor Axelsen’s shots with precision, grabbing the first game 21-11. However, the tall Dane came back with more lethal smashes, not giving any time to the Japanese to counter-attack. “In the second game, I played defensively but he has strong smashes so I knew I had to change in the third game,” said Momota. After a 15-21 loss in the second game, he bounced back in the third game with both players displaying tremendous shots, but the lead created by Momota got wider, and history was made as the one on top of the 21-15 final game was the Japanese star. China’s Chen Yufei, however, finally managed to beat her arch-nemesis, Tai Tzu Ying, denying the Taiwan star a third back-to-back All England title. Having lost the last eleven matches against the world #1, Chen Yufei knew she had nothing to lose before her match. The Chinese played the perfect game, committing very few unforced errors and remaining very stable throughout the match, where she landed a fantastic 21-17, 21-17 against the title-holder. “I didn’t expect to win in straight games. I think I am more mature mentally and physically than last year and this is why I was able to win today,” commented Chen Yufei, after grabbing the biggest title of her career so far, and certainly not the last. Indonesia’s Hendra Setiawan and Mohammad Ahsan let their experience do the talking against Malaysia’s youngsters Soh Wooi Yik and Aaron Chia. The two-time World Champions bounced back after losing the first game 11-21, dictating almost every rallies, with incredible ease. “The All England is a very prestigious tournament and we are happy and honoured and win it again,” commented Hendra Setiawan. The two Indonesians dominated every aspect of the game, rendering difficult a coup d’état from the rising Malaysian pair. Soh and Chia were forced to settle for runner-up status but it is still by far their career-best result to date. It was sweet revenge in the mixed doubles for Zheng Siwei and Huang Yaqiong, as they played the exact same final as last year, but not with the same result. 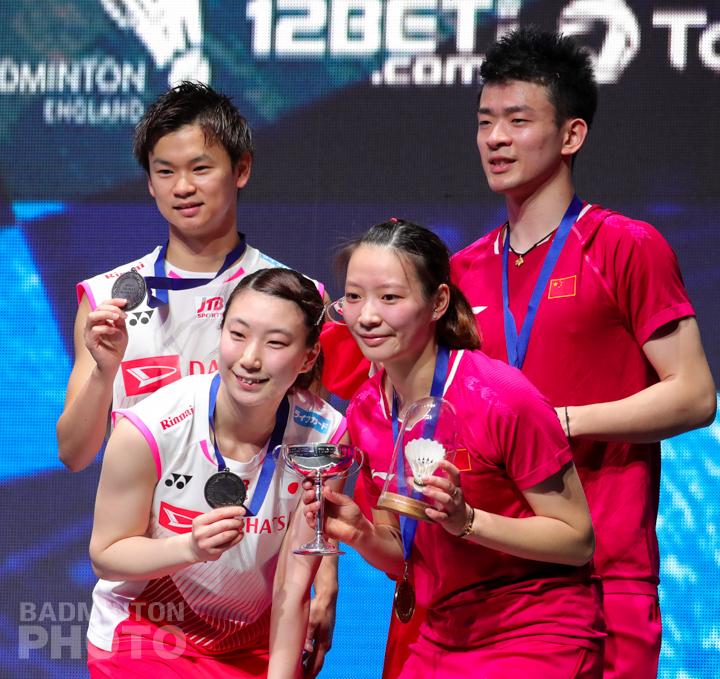 The nearly invincible Chinese pair eventually defeated Arisa Higashino and Yuta Watanabe, despite spending most of the second game lagging behind the Japanese duo. Carrying the momentum forward from their fairy-tale 2018 season, the world #1s once more ascended to the top of the podium, claiming the trophy after a 21-17, 22-20 win. 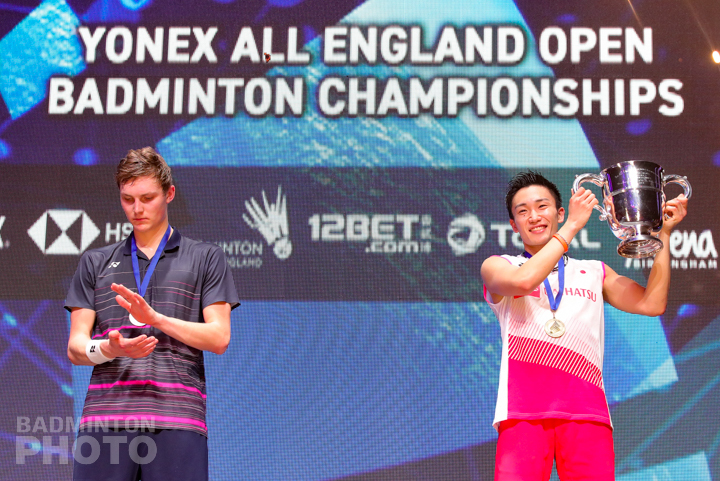 It was, in a way, third time lucky for Zheng, as it was only his third outing at the All England. He was beaten finalist in Birmingham last year with Huang, while in 2017, he and Chen Qingchen were top seeds in their first All England but went down in the round of 16. The Asian Games women’s doubles gold medallists managed after several months to break the Japanese wall in one of the greatest tournaments on the badminton calendar. Chen Qingchen and Jia Yifan stunned World Champions Mayu Matsumoto and Wakana Nagahara in a marathon match. “It’s just fantastic to win the title this year and we beat really strong opponents before coming to the final,” commented Jia Yifan after her 18-21, 22-20, 21-11 win. It was the first title for Chen and Jia under the BWF’s new World Tour format. 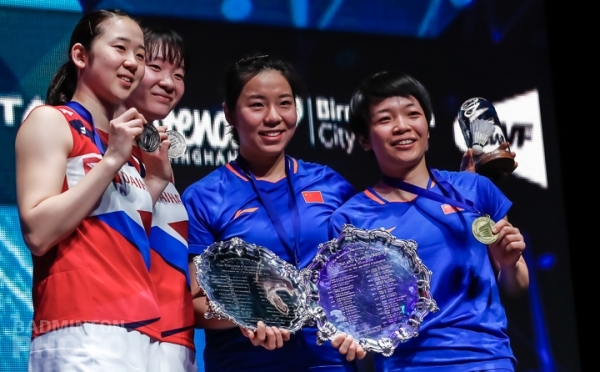 China, which not too long ago ruled women’s doubles, had not claimed any title bigger than a Super 300 since Chen and Jia won in Hong Kong in 2017.